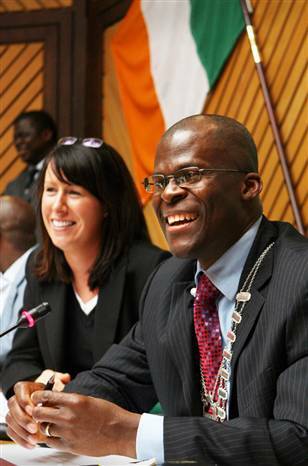 On June 28th, 2007, Rotimi Adebari , a Nigerian-born father of four, made history when he became Ireland’s first Black mayor. Adebari was elected mayor of the town of Port Laoise, in County Laois, in the province of Leinster, in the midlands of the Republic of Ireland. Adebari ran as an independent. Adebari came to Ireland as an asylum seeker in 2000 from Nigeria. Before I go on to discuss Rotimi Adebari, I want to take a closer look at the Republic of Ireland in general and the town of Port Laoise in particular. One can find parallels between the history of the Irish people and other colonized indigenous peoples. Ireland was literally colonized by the English. Even before the religious division that further divided English Anglicans from Irish Roman Catholics, the Irish (Gaelic) were viewed by their colonizers (Normans and the English) as uncivilized savages and barbarians. In reaction to the fact that many of Ireland’s colonizers were beginning to intermarry with and take on the culture and language of the indigenous Gaelic population, England enacted The Statutes of Kilkenny in 1367. The statutes forbade the English settlers from marrying the Irish, adopting Irish children, and using Irish names and dress because English authorities were concerned that the English settlers were becoming more Irish than the Irish themselves. The expression “beyond the pale“, which means unacceptable behaviour (His behaviour was really beyond the pale) actually refers to this time period. The Pale was the demarcation line between territory in Ireland that was directly under English control and therefore “civilized”. It is clear that the English really perceived the Irish as a different race. Even as recently as the 1950s, English landlords actually put out “No Irish need apply” signs while renting out houses and apartments. The Republic of Ireland has long had the reputation of being one of the most ethnically and religiously homogeneous countries in Western Europe. Since its independence from Britain, the Republic of Ireland has also been considered Western Europe’s poorest country. It’s been known more for its emigrants than its immigrants. So many Irish have fled Ireland over the last two centuries that the Republic still has a population less than it had before the Potato Famine of the 1840s (As a bizarre example of positive Muslim-Christian relations, The Ottoman Sultan actually donated money and three shiploads of food to support those starving in Ireland) The Irish abroad faced a great deal of discrimination based on religion and culture. Although many found success in their newfound lands, many also faced gruelling poverty becoming part of North America’s exploited working classes. As we can see here in Canada, many Irish settled in the Maritimes, worked in horrendous conditions in mines, and still haven’t escaped cycles of poverty. However, beginning in the mid 90s, the Republic of Ireland went through an economic boom, sometimes being called “the Celtic Tiger” in comparison with the economic growth of Asian countries. This led to an influx of immigrants from Eastern Europe, South Asia and Africa attracted by jobs and some of Europe’s most generous immigration laws. Several of these migrants came as asylum seekers (some 30,000), most from Nigeria. As you can imagine, integrating into a society like that of the Irish hasn’t been easy. The Irish government has recognized this and actually created a Minister of State for Integration! I would think that the recent crash of Ireland’s economy and rising unemployment (currently 14%) is only going to escalate anti-immigrant sentiment. The town of Port Laoise is about an hour’s ride outside of Dublin. As of 2006, Port Laoise had a population of 14, 613. That’s quite small I would think. The major employers in the town are the Irish Department of Agriculture and Port Laoise Prison, a maximum security prison which housed the majority of Irish Republican Army (IRA) prisoners sentenced in the Republic of Ireland. But the majority of prisoners are in there on drug-related convictions. The town is also the base of the international charity organization Self Help Africa, which promotes and implements long-term rural development projects in Africa. It’s the first Anglo-Irish development agency. It appears that Port Laoise is mostly a commuter town for people who work in Dublin but can’t or don’t want to live there. So how did this small Irish town make history? Rotimi Adebari was born in 1964 in Oke Odan, Ogun State, Nigeria. Ogun State borders the Republic of Benin. Its capital is Abeokuta. Although I haven’t discovered it in my research, I would assume that Adebari is ethnically Yoruba. He studied Economics in University. He was never involved in politics in Nigeria, however he did take on leadership roles at school and he was a chief of a local Palmwine Drinkards’ Club, otherwise known as a Kegite among Nigerians. He also worked in the marketing division of a television station. Rotimi hosts a local community radio programme, called “Respecting Difference” on Midlands 103. The programme draws on the presenter’s experience and his election into Portlaoise Town Council to serve as an inspiration to the socially disadvantaged in the community, by engaging in discussions that motivate and offer a lift to people currently experiencing social exclusion. Originally from Nigeria, Rotimi Adebari has lived in Portlaoise for the last 5 years. He is an elected member of Portlaoise Town Council, and has a Masters degree in Intercultural studies at Dublin City University. He is an elected member of the National Executive Committee of INOU – Irish National Organisation of the Unemployed, and is a director on the board of Portlaoise Community Action Project (PCAP). Rotimi is also a founding member of Suil – An organisation that provides support for the unemployed in Laois, and a member of Laois Ethnic Minority Support Group. Adebari also set up a consultancy firm, “Optimum Point”, which trains companies and educational institutions on cross-cultural awareness. It was one team, but in the team we had Africans, Irish and non-Irish as well. But when I went out knocking on doors I went with Irish members of the team. The reason is because I understand the society. This is a society that some people are yet to come to terms with their changing world. In November 2001, a man approached me on the street and said he had never seen a black man before. So you can imagine, if two black people then went knocking on the doors, the sort of reception they would probably get. And I thought that won’t be a good idea. I did go knocking on doors with Irish members of my team, and we were well received. That is not to say that there were no instances where people slammed their doors in our faces. But it was not because I am black. They slammed their doors probably because they were disillusioned with politics. I understand the issues. I was only four years in the country then, but my antecedent over those four years, what I have been involved in. I set up a support group for the unemployed. I was in the board of community organization in Portlaoise that caters for the lone-parents, the travellers, etc. So I understand the issues of each and everyone. And it was all these issues that I brought together, in putting my manifestoes. What is there for the unemployed in the country and what is not there for them? What aspect of education do I want an improvement on? Services to the youths and the elderly. Is there anything in the town for them? All these and more were the things I put together. When I arrived here in 2000, if anyone had said to me that I would be going into politics, I would have said to that person that he was joking. I felt I was not cut out for politics. I was looking at politics the way it is played back home in Africa. We all perceive politics like dirty water: if you don’t want to get stained, don’t get involved. I remember during my college days in Nigeria my Political Science lecturer used to say to us that, if you want to know the name that people call you at your back go into politics: they will no longer call you that name at your back, they will say it to your face. I would have arrived here with that mindset as well. But I see those of us who are here as the first generation of immigrants in Ireland. That is not to say that immigrants have not been coming here before we arrived, but it wasn’t as evident as it is in the last ten years. So we are like the first generation, and we know we have to really put something in place for generations coming behind. It got to a point that I had to say to myself what legacy do I have to leave for generation coming behind? Maybe one of those legacies would be to get involved in politics. One other thing that might have led me into politics was the image of Nigeria in Ireland at that time. They associated anything with Nigeria with fraud, criminality and all that. So it was like something has to be done. And I thought maybe politics was one of the ways to go: if I got elected people would begin to see that we are not all criminals. There is no doubt that Adebari is a pioneer and the immigrants of Ireland will need him because I foresee that times will be tough for them now that Ireland’s economy has crashed, and not only will they face discrimination at work and school, but actual physical violence. Frankly, I’m afraid for them. And they include one of my Nigerian cousins and her family who live in Limerick. But I am also hopeful. Many immigrants in Ireland, particularly Africans, are making names for themselves and showing that African immigrants are not all criminals. Maybe someday, they too will be accused of being more Irish than the Irish themselves. Akina Dada wa Africa (AkiDwA; Swahili for sisterhood) is an authoritative, minority ethnic-led national network of African and migrant women living in Ireland. The non-governmental organisation with charitable status was established in August 2001 by a group of African women to address the needs of an expanding population of African and migrant women resident in Ireland. The organisation is a recognised authoritative and representative body for migrant women, irrespective of their national/ethnic background, tradition, religious beliefs, socio-economic or legal status. AkiDwA’s advocacy approach is based on a gender perspective and the organisation promotes an equal society, free of racism, discrimination and stereotyping. AkiDwA’s advocacy approach is based on strengthening migrant women’s voice, applying a gender perspective to policies and practices and the promotion of equality of migrant women in Irish society, free of gender and racial stereotyping. A Short History of Ireland: A BBC Radio Series that tells the story of Ireland from the Ice Age to the present over 240 episodes. Transcripts of each episode are available on this site.